Fences help define your home, property, or business. Most fences are selected to achieve a specific purpose whether it is a fence for privacy, a fence to restrict a specific area, to help control animals, or for decorative purposes. Fences come in all sizes, shapes, and materials that are suited to meet our clients specific needs and objectives. Commercial fencing utilizes many different types of fencing depending upon the needs and objectives of a commercial business. Standard and black chain link are very commonly used for fencing off or in specific areas; such as: ball parks, tennis courts, parking lots, etc.. However, custom wrought iron and aluminum are also very common for fencing and railings at your local Pizza Hut or Coffee Shop, apartments, condos, and many other commercial areas along with electronic security gates. Wooden decks & pergolas commonly are worked into the landscape and property with fencing to enhance the usage of your outdoor property. They are functional for usr in the warmer months that allow you to enjoy your property to the fullest. Decks and pergolas offer more functionality for your outdoor living area. Ornamental iron gates and designs are typically built to enhance the beauty and completion of a yard fence or driveway while providing additional security, if necessary. 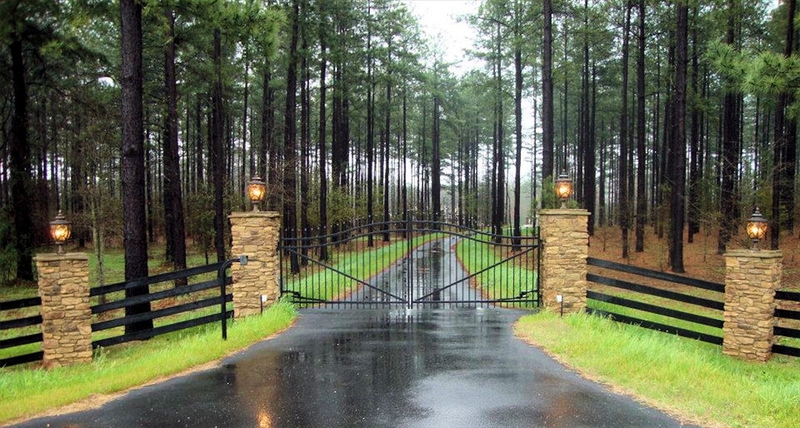 Many local and rural properties including farms utilize electronic estate gates for their beauty, security, and ease of use. 4 rail horse fencing and farm fence is built to be easily installed, smooth, and strong to minimize the impact on your animals should they come into contact with the fencing. The rails can also be reinforced with wire to limit access from small critters. Welded wire fencing and or hog fencing is also commonly used to control hogs and protect gardens or crops. Agricultural Fencing often requires many different types and styles of fencing depending upon the terrain and animal variables you wish to control and protect. Ornamental Wrought Iron & Aluminum Fencing has a multitude of uses around a home and commercial properties; such as: apartment complexes, condos, and commercial or industrial property. It can provide beauty, strength, and durability. PVC vinyl fencing is made from a plastic that is basically maintenance free. It does not rot or stain. It does not discolor from sun exposure and is very strong. You simply rinse it off with a garden hose. Wood yard fences are traditional fences that can add beauty to your home and yard or business with designs that achieve your objectives whether you want a wood picket fence, woven fences, privacy fence, or cedar fence. Coming in all sizes and shapes, they can restrain kids, pets, and can even provide a barrier to wind and noise, if necessary, and yet improve curb appeal. Wood fences are adaptable to the terrain.